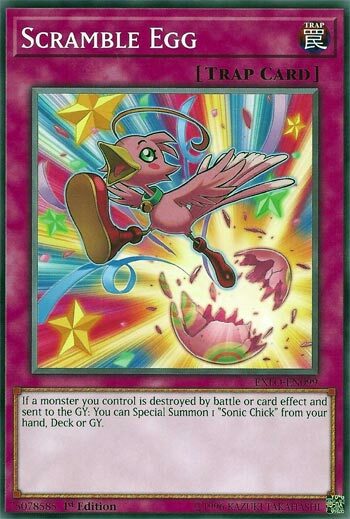 If a monster(s) you control is destroyed by battle or card effect and sent to the GY: You can Special Summon 1 “Sonic Chick” from your hand, Deck, or GY. Today we have a special review for April Fool’s Day and Easter Sunday, very rare that both align to be on the same day. Today, we look at the best card in Extreme Force and the reason you should be buying cases upon cases of this set, Scramble Egg. Yeah, in all seriousness, this is terrible. Art: 3.5/5 Sonic Chick is pretty cute, though. Happy Sunday, Happy Easter, Happy April Fools…that’s a lot going on in one day. Scramble Egg…well, it does something, right? It’s a 1-for-1, so it’s got that going for it. If a Monster (or Monsters) you control is (are) destroyed by Battle, or card effect, you get to Special Summon a Sonic Chick from your Hand, Deck, or Graveyard. It could be useful, I guess, against one attack, maybe more. Sonic Chick is immune to Battle destruction against Monsters with 1900 attack or more. But only has 300 attack and defense on here own I believe. This is a Yusei card, and Sonic Chick was a signature card of his, of sorts. Neither card is gamebreaking, but neither card is garbage either.